I am a huge supporter of the Dublin Fire Brigade ambulance service and their crew who provide an excellent service to the people of Dublin alongside the National Ambulance Service. They are all much admired by the community for the work they do. 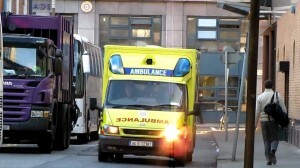 However, there is room for improvement and Dubliners deserve the best from their ambulance service. The bodies which control the NAS and Dublin Fire Brigade – the HSE and the four Dublin local authorities respectively – have come to an agreement to integrate their back office operations. It is vital that full consultation with unions now takes place over the six month transition period, as set out under the Haddington Road Agreement, before any new measures come into play. I have made that very clear to all involved. I will not stand for a single Fire Brigade ambulance being taken out of service. If anything we may need more. What is now being proposed is that the National Ambulance Service will take over back office functions such as call-taking, dispatch and clinical governance, from its new National Emergency Operations Centre in Tallaght. This is happening because HIQA has raised concerns around the fact that Dublin has two ambulance services that are not integrated, especially the fact that some patients occasionally fall between the two stools when calls are passed between the two services. HIQA has identified this as a patient safety risk and it cannot be ignored. All decisions made will put the interest of those who need a ambulance first.